Each year the Sacred Kingfisher birds return from their winter migration north to nest on the Merri Creek. 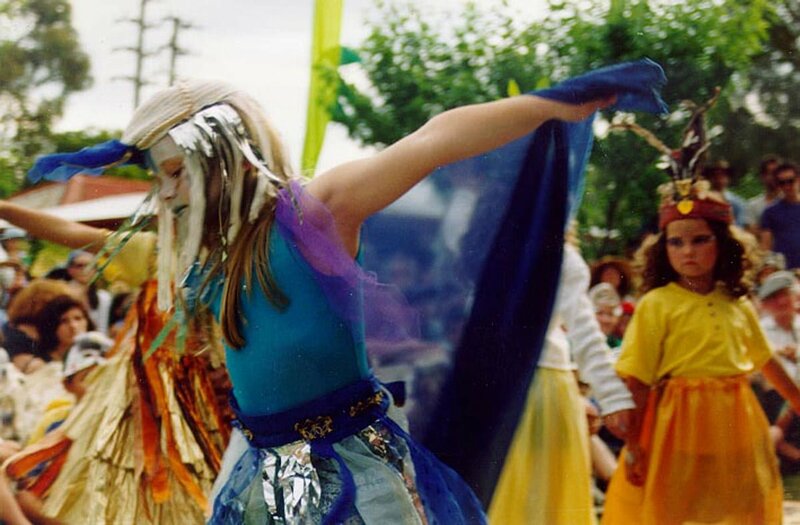 Ceres welcomes their annual return with an extraordinary festival , a community ritual celebration. 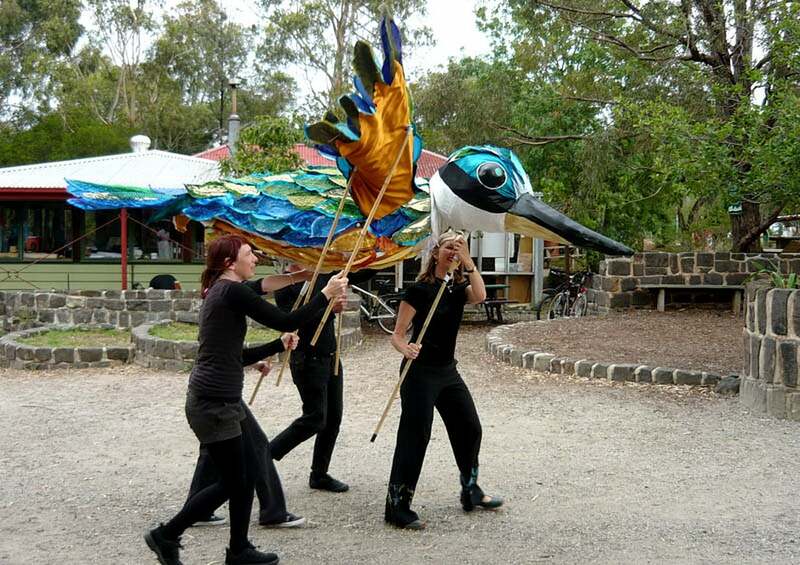 In 2009, Ceres Environmental Park commissioned a new puppet for the annual Return of the Sacred Kingfisher Festival. 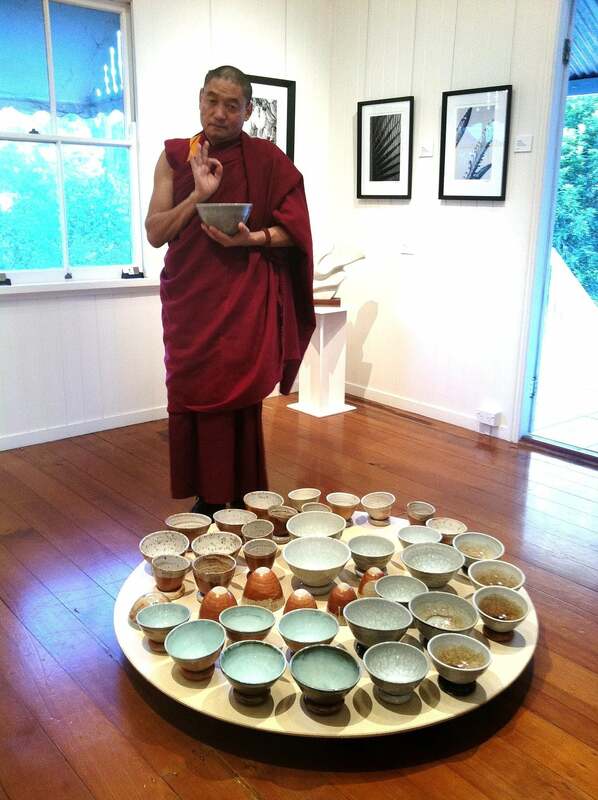 Funding was secured from several sources including Arts Victoria, and Arts Queensland pitched in with an artist airfare. Decades ago a Sacred Kingfisher, not seen for years on the Merri Creek in inner city Melbourne, arrived with a flourish at Ceres. Every year since that event, people have gathered to celebrate this beautiful bird and its seasonal pilgrimage down from Queensland. 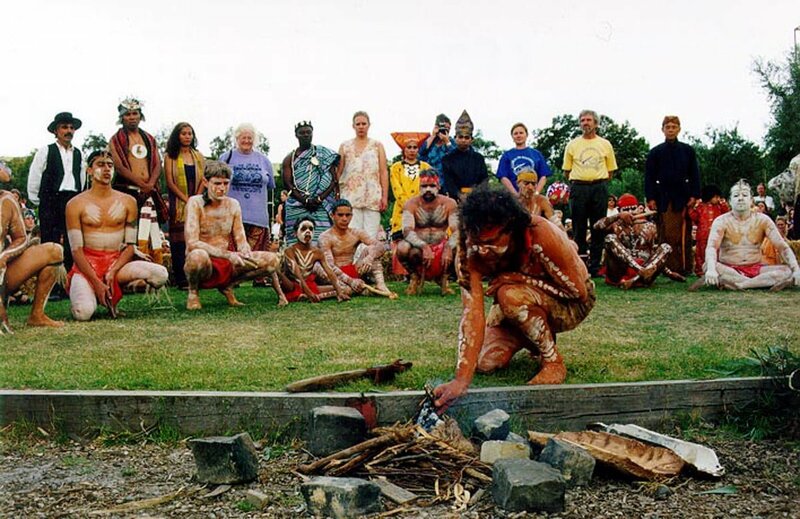 Community also celebrate the hard work done to clean up and revegetate the Merri Creek, to make it the haven for animals that it has become, and a place of beauty and sharing for all. Kari stumbled across the festival 13 years ago and was so impressed she returned nearly every year for a decade, to work on the festival artistic team. 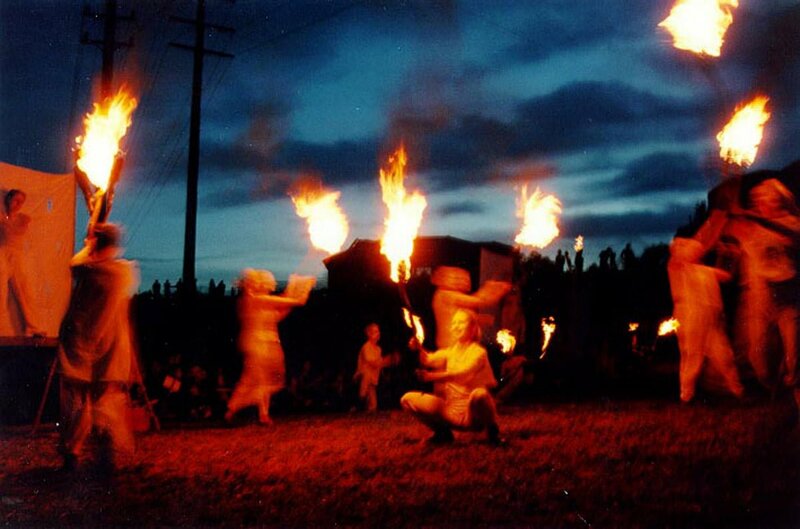 She even began a sister festival in South East QLD, called Splash! 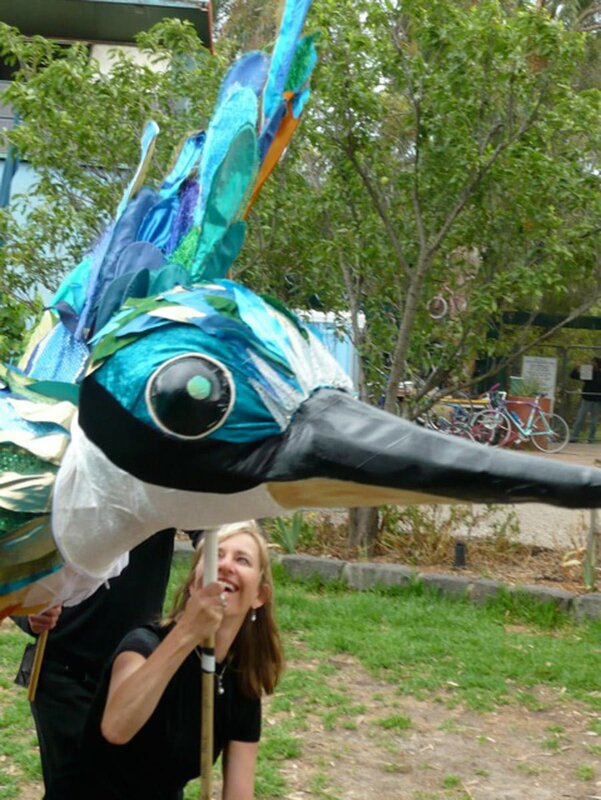 Kari migrated from Queensland in 2009, to create the puppet over several weeks in residence. She usually lives in a small town on the Sunshine Coast Hinterland, where Sacred Kingfishers nest in the wetland opposite her home. She observes their annual return to the same spot to nest and raise young. Each spring they begin calling to mark the territory around the wetland, and her home. 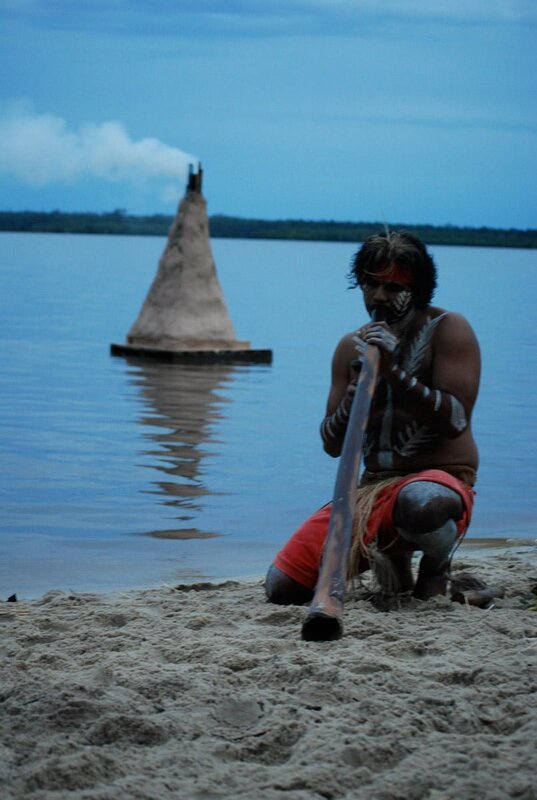 Kari has been attending the festival regularly claiming it is one of the most poignant events in Australia. For this reason she feels honoured to be a part of the creative team. “Their calls are so distinctive. I know the day they have moved back in, as the male bird circles my home calling, calling.” She says. "This is usually a reminder to book an airfare to Melbourne!" The new puppet is constructed from pahang cane and cloth. Each feather has been machine appliqued from 3 - 4 layers of fabric, then sewn to the skin of the bird. A clever articulated wing design previously created by Emma Pryce was embedded into the new wing and she can fly again. Assisted by a team of passionate puppet makers, Kari completed the puppet in 3 weeks on the CERES site. At a special farewell ceremony the old matriarch Mama Kingfisher was laid to rest and her daughter took a breath of life taking up the dynasty and flying for the first time at the 2009 Festival. Look out for Mama Kingfisher’s return to CERES each spring.